The gated entrance into Challis Farm. Challis Farm is a hidden gem among South Charlotte’s gated communities. It is an upscale community of homes that has a great central location with proximity to many Charlotte destinations as well as security. Located off Pineville-Matthews Road near Rea Road, Challis Farm is across the street from Calvary Church. The neighborhood is sheltered from road noise and street views by a heavily wooded burm along Highway 51, which adds to the privacy of the neighborhood. 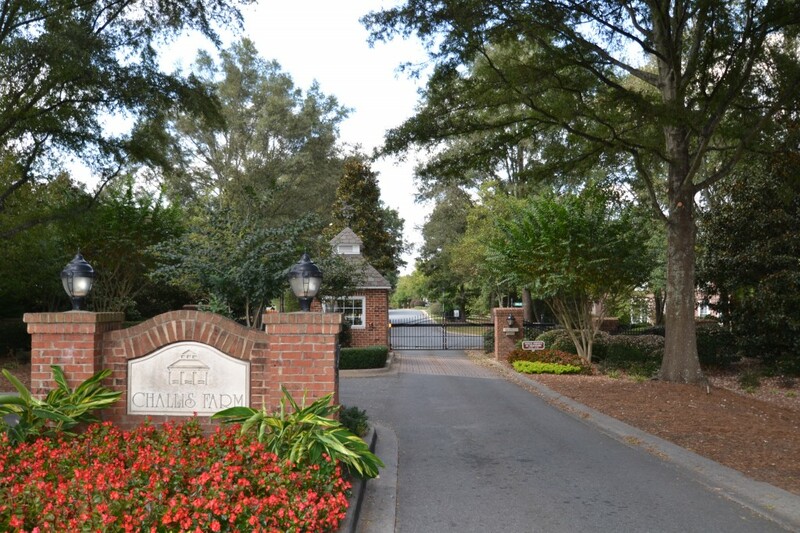 From Challis Farm, Ballantyne and Carolina Place are less than 5 miles away. The SouthPark area is about 7 miles away, while a commute Uptown is 13 miles from Challis Farm. 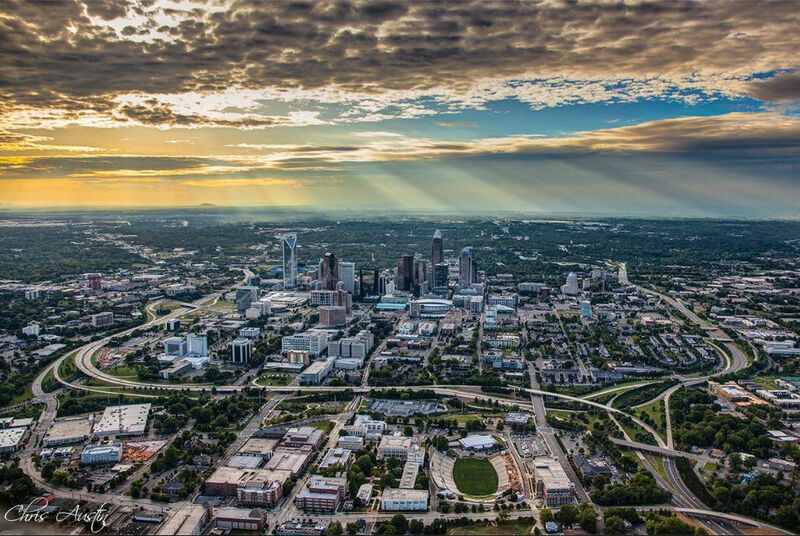 The neighborhood is located close to all the major thoroughfares most used to move around Charlotte. I-485 access at Rea Road or near Carolina Place is about 3 miles from the neighborhood. Everyday shopping can be done in several locations convenient to Challis Farm – Shops at Piper Glen, The Arboretum Shopping Area near Providence Road and Colony Place at Rea and Colony roads. For the golf fanatic, Challis Farms has a golf cart path that connects residents to Carmel Country Club. In addition, Quail Hollow Country Club, TPC at Piper Glen, Ballantyne Country Club and the Club at Longview are all within 10 minutes of Challis Farm. The small neighborhood of homes was built in the late 1990s around 18-acre Challis Lake. 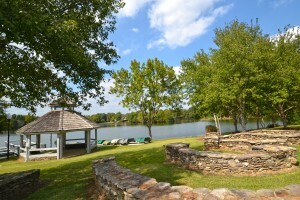 There is a gazebo and fishing dock as well as a small boat dock for residents to use. Approximately 20 Challis Farm homes are considered waterfront. Home sizes range from around 3,500 square feet to more than 5,300 square feet on lots of about one-third of an acre to more than half an acre. Challis Farm is a highly desirable neighborhood with homes that sell from the $500,000s to more than $1 million. This upscale home with a private sport court and pool sold last year in Challis Farm. In the past 12 months, 5 homes sold in Challis Farm for an average sales price of $656,690 and about $174 per square foot. Those sales average near 96% of list price. There are currently 3 homes on the market in Challis Farm. Only 1 is under contract as of April 20. Given past per-month sales data, the current inventory is at more than 7 months in Challis Farm, which is not unusual for a neighborhood in a higher price point. The neighborhood is zoned for McAlpine Elementary School, South Charlotte Middle School and South Mecklenburg High School. Private Charlotte Country Day School and Charlotte Latin School are also less than 10 minutes away from Challis Farm.